Lineman Rock officially launched their lineman shirt line with the announcement and introduction of their first hand drawn design. Linemen Rock launched their innovative line of lineman shirts earlier this month with the introduction of their first design, Bust'n A Load. The industry correct design features a lineman on a pole using a hot stick to bust a load in the darkness as a bright flash occurs. All of the designs from Linemen Rock will feature illustrations of linemen completing common duties that are exciting or definitive of the industry. Owned by a line family, Linemen Rock originally launched their business to bring innovation to a stale industry. Many of the long-standing companies in the industry have stopped producing innovative or interesting designs. Those in the industry that are working to bring new ideas seem focus on the scary or negative. The designs are appealing to most linemen, but in an industry that finds itself on the top 5 most dangerous jobs list, some have chosen to avoid reminders of the danger of the job. "Dozens of line related businesses have opened on print-on-demand websites because the shop owners haven't found what they are looking for on larger industry websites. With the lack of interesting designs and quality in the industry, I decided we needed to offer more to the thousands looking for interesting lineman t-shirts and lineman decals. I also wanted to support the line industry and the families of linemen who have been lost on the line," stated Krista Conway, owner of Linemen Rock. Mrs. Conway is no stranger to the power line industry. She has been married to a Journeyman Lineman since 2000 and founded a popular line wife support group in 2008. The group, which now boasts over 900 members, has grown dramatically in the last few months. "I have always been paid to promote other peoples businesses, but in December of last year I decided to start working on my own projects. Since then the size of the Powerline Wives group has doubled and Linemen Rock has gone from being nonexistent to a force to be reckoned with," continued Krista. 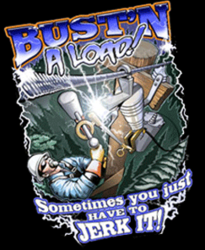 Lineman shirts and decals are popular in an industry that is very proud of their line of work. Krista was rather candid regarding her feelings about the power line industry as a whole and the services offering shirts and decals. She continued, "Linemen work a dangerous job that provides a service that no one can live without. No passer by is going to stop and do a lineman's job. They simply can't. Linemen cannot be replaced and our country cannot function without them. That fact is proven every time there is a large storm where thousands lose power. We hope that our designs will bring pride and awareness to the men and women that risk their lives everyday on the lines. This industry has been nothing if not poorly served in terms of the designs of lineman shirts and other items available for purchase and we plan to change that." Linemen Rock's store opened on January 24, 2012 and has already captured a percentage of market share. For more information on Linemen Rock or Powerline Wives, please visit their respective websites at http://www.LinemenRock.com and http://www.PowerlineWives.com.